How many pictures will you take during our wedding? One thing that digital allows for is the ability to take many pictures. This means when in doubt, take the picture. Once a wedding is done, I will upload the images and edit and select the best images to pass on to you and post on-line. On average you can expect to receive 50-75 final images per hour of photography. How will I view and order my photos on-line? You can get to your gallery and our storefront by clicking on the "Client Galleries" tab above. Pictures can even be shared to Facebook or Pinterest right from the gallery. From this storefront you can also order prints & other products. They will then be processed at a professional photo lab and sent to you. Please allow roughly 2 weeks for delivery. Perhaps more during the end of November & December. How many locations can we take pictures at during our portrait session? As many as time allows for. For senior and family sessions there may be an additional mileage charge after 20 miles one way to the furthest location. Weddings require a non-refundable retainer of 50% of the package cost upon booking the date. The remainder is due no later than the wedding day. Payment can be made by cash, check, or credit. Payment for family and senior session fees is due at the time of the session. When is the best time for portrait sessions? In general, it is best to photograph outdoors in either the morning (right at sunrise) or evening (before sunset). During the middle of the day, the sunlight can be very harsh. An overcast day does provide some of the best lighting but you may loose some of the highlights you gain from a sunny morning or evening. So clouds or sun, we can create amazing images. Perhaps the very best time to shoot portraits is from 45 minutes before sunset to 20 minutes after. In photography, this is called the "golden hour". This information may be helpful in planning out your wedding schedule in an attempt to allow time for outdoor portraits. That being said, I've photographed during all times of the day and we are always able to get good images. These suggestions just represent the ideal. What will come with Master Access? Master Access can be purchased with all portrait sessions. My top two wedding packages include Master Access as well for your wedding day images. Master Access allows you to download the finished, high-resolution versions of all your images through your online gallery. This access also includes Printing Rights or what we call "Home Rights Use" on the contract. What is "Home Rights Use"? This means the digital files of the images can be used for your own personal use. You may make prints from the digital files for your own use or to give as gifts, or to upload to your blog or website (we'd love it if you credit us though) or make additional copies of the files for personal back-up purposes only. Why do you offer so many prints sizes in your online store? Digital SLR cameras shoot in a 2:3 format. For instance a 4x6 is also in a 2:3 format. However, an 8x10 is not so it will be cropped on the sides to fit. The bad thing is that most common size frames are not in a 2:3 format. When ordering pictures on-line through us, each image will be adjusted to the best of our ability to fit into the size print you order. Why do professional lab prints cost so much more? First, our labs use the best equipment and employ the best staff to make sure prints and products turn out amazing. Secondly, you must think of ordering prints as purchasing art. You wouldn't think of hiring someone to paint your portrait and pay only for the canvas and paint. Photographers are artists capturing their vision on paper through a camera. The price isn't determined by the paper it is printed on as much by the image placed on it. But when you consider all of the things you spend money on to decorate your home, images of you and your family will be appreciated more than anything else. Yes. Everything will be shot on professional Canon DSLR digital equipment. Do you edit photos and touch up the prints to remove blemishes, etc.? Yes. All images will include editing to improve exposure, color, etc. Full touch up of blemishes etc. are done to senior/family portrait headshots (basically zoomed into upper torso) and closer. Any print ordered at an 8x10 or larger will also receive full touch ups. If you would like additional touch ups done please contact me and we can discuss details and cost if necessary. One difficult thing to eliminate is glare from eyeglasses but we will do our best. If you have frames without lenses, it will eliminate any potential glare. It will take no more than 60 days for weddings and 30 days for family, senior, and engagement sessions to edit and prepare your images for you to see and they will be immediately available in your online gallery. We spend a significant amount of time preparing your images but his is to make sure they look as good as possible. Can we tell you certain images or group/family shots that we want? Absolutely, feedback during any of our sessions is welcomed and encouraged. We will sit down prior to your wedding to discuss anything you would like us to shoot. If there are certain groupings that you would like during the formal portrait time, please put together a list and get it to us. It is hard for us to know from wedding to wedding the different family dynamics, so please let us know what groupings you would like. What if you aren't familiar with our wedding location? Weddings happen in all sorts of places. There are so many great venues in northern Michigan and each year there are more. We have been doing this for 8 years and every year we got to photograph at new locations. This is one of the skills you pay for when hiring a professional, we can quickly scan a location and find beautiful locations and beautiful light for photography. 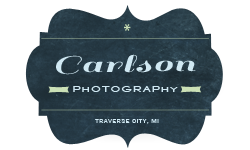 I primarily photograph in the Northern Michigan/Traverse City region. This would include Grand Traverse County and it's surrounding counties. However, we are willing to photograph anywhere you'd like. If additional travel is required we can work out the details. Please contact us and we can tell you if there will be any additional charges. Will my family and friends be allowed to take pictures at the wedding? Yes. It is fine if some of your family would like to shoot over our shoulders. We may politely give some instruction as to when they can shoot if there are any issues. We do think it is worth considering an "unplugged" ceremony, however. Having people hold up phones and cameras or even leaning into the aisle (and yes, they do this even when the bride is walking down) can be a distraction to you and your guests and can interfere with our photography. Should we do the portraits before or after the ceremony? We encourage setting up a "first look" so the bride and groom can have their special moment of seeing each other for the first time. This also can give us more time to hit multiple locations. Often once the ceremony starts, the time crunch begins as well. No one wants to feel rushed and even worse, not have the time needed to get the images you want. These images will last forever so it is better to take the time. Wouldn't it be nice to go to your own cocktail hour? Chat with all your friends and family who have traveled to be with you? If you decide you want to wait until the ceremony to see each other, we encourage you to plan enough time in between the ceremony and reception for portraits. Your wedding packages have times down. How many hours do you think I will need? This largely depends on how you structure your day. We recommend 9 hours as a minimum for most weddings. Some things to consider are when and where you will want portraits done, how many locations you'd like pictures taken at, how long of a reception you plan to have, how much of the behind the scenes or candids you want to capture, whether there is a long break in-between the ceremony and reception. This is a decision I can help you make. You'll also often hear me say that we care about your experience during your wedding so we don't want you to feel rushed. We want you to have time to get the images you want because you won't have an opportunity to do it again. We want you to be able to take in as much of your wedding celebration as possible. Check these two documents for more information. Tips for Staying on Time and Suggested Timeline. I'm kind of nervous about you being in the dressing room to take pictures? This is completely understandable. If at any point you need us to leave, please just ask and then let me know when I can come back in. Ideally, we'd like to get some shots of putting on the wedding dress, make-up, gift giving and just all of the candid moments that happen while getting ready. Do you have any advice on decorating? First, boring backgrounds can often make for boring pictures. Consider this anywhere we'll be taking pictures. This includes your dressing room, ceremony and reception. If you can find a dressing room with windows (sometimes placing some thin or gauzy fabric over the windows will add some privacy while allowing for nice light), then add some color, candles or other decorative elements it will make all the difference. Even more so than that though, make sure to pick up the "mess" as best you can. You typically will spend a lot of time decorating for the ceremony. The only thing to add would be to consider what direction you'll be facing. Do you want pictures of your faces or backs? Sometimes the photographer can get pictures from the front and back but this is not usually the case. If you are doing unity candles, setting it up so we will see your faces will make for a better image. Your reception also is filled with little details that will show up in photos. If you can create decorations that circle the space it will be helpful because images will be shot from all angles. Sometimes just hanging Christmas lights or other decorative lights will create a beautiful effect for your reception pictures, especially if you will be having dancing. Any advice on throwing the flowers? Don't rush. Play it up with the crowd and girls ready to leap into action. Pausing just before throwing will give me time to capture you looking over your shoulder and the girls waiting. Check overhead to make sure there are no lights or ceiling fans to get in the way. And if things don't go right, don't be afraid to ask for a do-over. Is it customary to feed the photographer? Typically vendors will not be eating at your reception. However, most vendors aren't spending between 9 and 12 hours working at your wedding. You don't want your photographers passing out from a lack of nourishment do you? We will be shooting a lot during your reception but not the entire time so there is usually time for a meal and the camera will be ready to capture anything that comes up. Seating your photographer in the same room as your guests will allow us to see what is going on and capture any special moments. That being said, our priority is always getting the images you want. If we feel we don't have time to sit and eat because of a compressed reception schedule or we are running behind for some reason, we will pass on the meal. Any advice in exchanging our rings? First, using the hand opposite the audience, hold the ring with two fingers, one on top and bottom of the ring as you slip it on. This opens up the view of the ring. Second, with your other hand hold onto your partner's wrist from beneath their hand. I'll be going tanning before the wedding, is it better to shoot for medium rare or crispy? My recommendation is to save the sun for after the wedding. You'd be surprised how often being overly tan or even worse, burnt, will not look good at all in pictures. Then add the peeling skin and bad tan lines and the focus on you and the beauty of your day will be lost. You are allowed to bring as many changes of clothing as you would like. Your session includes a set amount of time so you must decide how much time you want to spend changing clothes and how much time taking photos. Keep in mind your changing room will often be your car. Do you have any recommendations for clothing choices? In general, bring things you feel comfortable and good in. It may be good to bring something casual as well as something dressy. Also feel free to bring athletic uniforms or gear or anything else that shows off your interests like instruments, etc. Layers work well too so that you can quickly change the look of your outfit. For family or group photos you don't have to "match" though some families will do a very specific clothing option (Jeans with white shirts for instance) choose clothing in the same tonal range (dark to light) for each person. This keeps one person from dominating the photo. Also think of color groupings instead of matching all the colors such as earth tones, neutrals, grays and purples, etc. If the weather decides not to cooperate with us for a family or senior photo session, the session can be re-scheduled. Bad weather would primarily be considered rain. How many family members are allowed in a Family Session? You are allowed as many family members as you would like. However, with more family members comes more time required to pose and set up images. You will need to consider the balance you want to strike between numbers of people involved and time available to take photos.